The scene outside of the Fitzergald home as Gardai carried out their investigations. 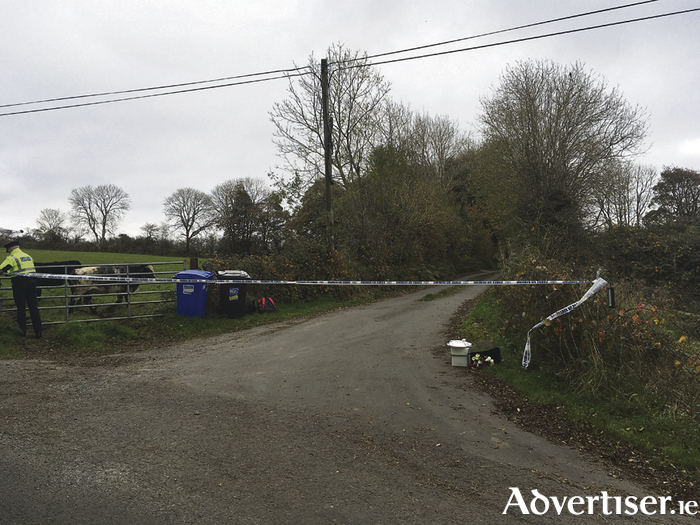 The tight-knit community of Irishtown was stunned and saddened this week by the discovery of the bodies of a well known local couple Kitty Fitzgerald and her husband Tom at their home in Knockadoon, about 1km from Irishtown village close to the Galway border. Their bodies were found on Tuesday afternoon shortly after 3pm, with Kitty's body found inside the house and Tom's body outside the home. Their son, who was also at the scene, was brought to University College Hospital Galway before being transferred to the Beaumont Hospital in Dublin for treatment to serious injuries. The Garda Technical Bureau carried out a detailed search of the family home and surrounds on Wendesday morning, arriving shortly after 10.30am, before the couple's bodies were removed to Mayo University Hospital later that afternoon for the process of a post mortem examinations which were due to be carried out yesterday afternoon. The results were not know at the time of going to press. Chief Superintendent Pat Diskin said of the Gardai investigation into the pairs death: "I'll be satisfied that the answers to our inquiries lie within the location of the incident." Local parish priest, Fr Martin O'Connor, spoke to the Mayo Advertiser on Wednesday morning in the village of the sadness and shock that was felt in the community following the discovery of the bodies of the couple. Fr O'Connor who has served as parish priest in Irishtown for the past 14 years, said: "There is great shock and sadness at the death of Tom and Kitty, because they were very much part of this community. They were very involved in both the church and the wider community as well. Tom was a Eucharistic minister in the church and a collector, they were pillars of the community. No funeral arrangements had been announced at the time of going to press. Parish Priest tells of saddness in Irishtown following death of "Pillars of the Community"
Page generated in 0.1426 seconds.